Mix all ingredients together except the ingredients for your barbecue sauce. Form the hamburger mixture into small balls about the size of golf balls. Place in a 9x13 pan. 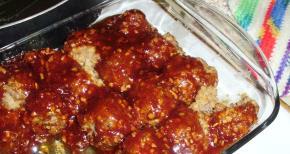 Prepare barbecue sauce and pour sauce over meatballs.